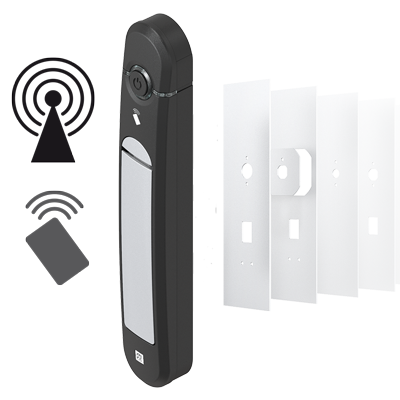 The Agent E Wireless is still the only swinghandle with wireless communication. Due to its wireless and thus cost-saving mounting it is most suited for retrofitting in data centres. The authentication is done either by RFID cards. A highly-efficient power management guarantees a long battery life. The authentication can be effected by fingerprint or RFID transponder cards with 125 kHz or 13.56 MHz. Remote opening is always possible in addition. The installation in the cabinets / racks of of different manufacturers is solved with with various adapters.